I gotta say, I was pretty psyched it reached 40 degrees over the weekend. I loved being able to layer lightly and not have a coat to worry about. Is it going to continue? Nope. That's why I'm getting the most out of these loafers while I can...definitely my best purchase in awhile. I highly recommend getting yourself a pair, they just seem to make everything so casually chic. This entry was posted on Monday, February 3, 2014 and is filed under bb dakota,black,burberry,gold,paige denim,vintage. You can follow any responses to this entry through the RSS 2.0. You can leave a response. I know what you mean about taking advantage of milder temperatures whenever possible, Sheree...I've been doing exactly the same!! This vintage gold cardigan layers so well over the long, black vest, and "dresses up" the more relaxed jeans-and-loafers bottom half of your look. Perfect for errands...or even a casual day at the office!! That's an awesome jacket, I love the style, classy like a blazer yet it looks very comfortable. Perfect with the black vest underneath. Fabulous look. I am so happy we are having a very mild winter and hardly any snow here in Bavaria this year! Nice jacket, you find the amazing vintage items Love. Great outfit! Love the jeans. Oh, I can not wait until we hit 40° - It will probably be almost April by the time that happens in Illinois though :) Right now I'm just happy it's above 0°. Great outfit, I really like the mens inspired but glamour feel it has - the textured out your jacket is fabulous! That jacket is awesome and I love how you styled it! Wow, what a gorgeous cardigan! Love the shoes too. Gorgeous jacket...and how sweet was that 40 degrees,right?! Unfortunately snow storm on the way tomorrow...yuck! I love those loafers, I wish I could wear them! I have tattoos on my feet and loafers always tend to make them look weird. 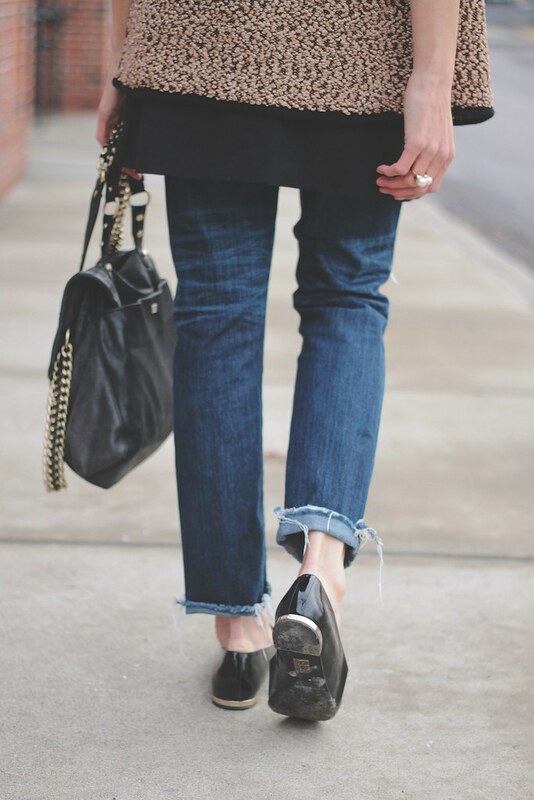 I love this laid back look! 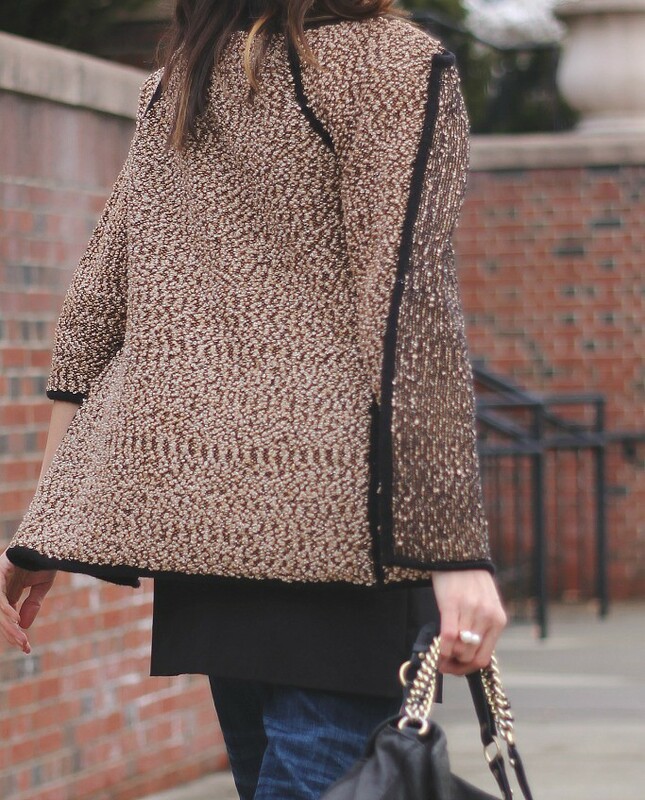 wonderful texture on that cardigan! such an incredible find! You look fabulous! I love this look! Black and Gold has got to be my ultimate favorite color combo. Something about it feels so modernly regal to me. As for the weather, what the what is going on right now :( This snow is the worsttt. That jacket is sensational! Thanks for sharing at Funday Monday.